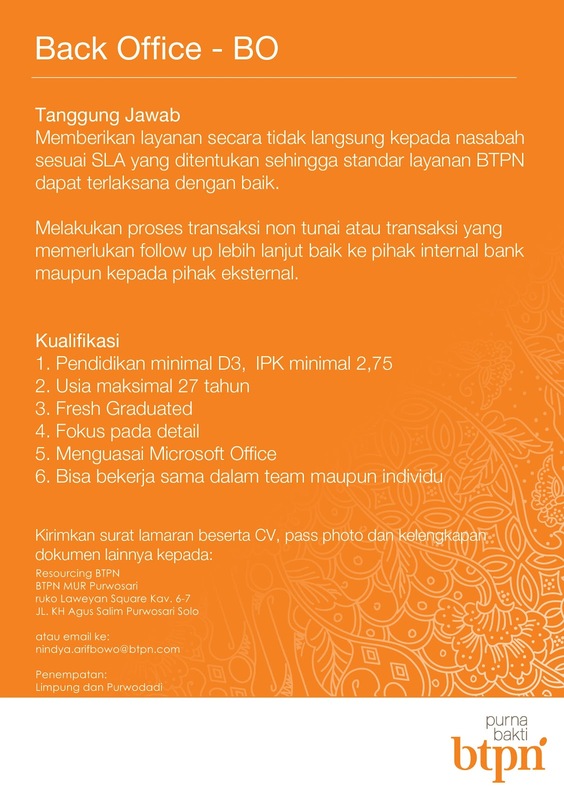 PT Bank Tabungan Pensiunan Nasional Tbk or Bank BTPN is a reputable private-owned banking companies in Indonesia. Initially, the Company was set up on 1958 in Bandung, West Java, under the name Bank Pegawai Pensiunan Militer (BAPEMIL), and served retired military personnel and in 1986, changed its name to current name. The Bank’s head office is located in Jakarta and operated with business segment in funding business, pension business, micro & small business, and sharia business. As of year-end of 2011, the Company operated 1,188 branch offices in 240 cities in all over Indonesia and also supported by 57,331 ATM networks. In 2011, the Company launched its social Daya program as an integral part of its business and sucessfully piloted its Syariah’s Community Banking Business under the name Tunas Usaha Rakyat (TUR). Only short-listed candidates will be considered. Jobelist.com - Powered by wordpress - 20 queries. 0.742 seconds.